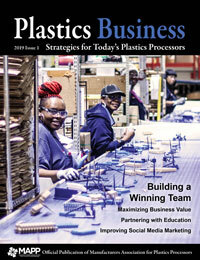 In the plastics industry, as in every industry, people are among a company’s most valuable assets. Three companies in the industry – a molded parts producer, a custom extruder and a custom injection molder/thermoformer – have shown their belief in this principle by investing in and implementing best practices in training and career advancement. Their investments have paid off handsomely, with results that include increasing the ability to attract employees, closing the skills gap, upping retention for new hires, standardizing company-wide training and establishing clear career advancement paths for valued employees. The companies have work forces ranging from 100 employees to 1,250 employees. They have created training and advancement programs specific to each company’s identity and human resource needs. Plastics Business asked Engineered Profiles, Nicolet Plastics and Wilbert Plastics Services to share details of their experiences in identifying the need for new programs, the ways in which they defined the employees eligible for participation, challenges that occurred in implementation, measurable benefits, unexpected results and stand-out employee stories. Engineered Profiles LLC, Columbus, Ohio, is a producer of custom plastics extrusions, employing 250 full-time associates. Brad Lamone, vice president of workforce development, described the company’s customers as OEMs in a variety of different industries, including fenestration, building products, agriculture, transportation, energy and appliances. Three years ago, when Engineered Profiles’ mentor-based training system was assessed as inconsistent and the company lacked a formal advancement plan, management decided to create an extrusion-specific training system. The initial goal was to take a new employee with no extrusion experience to the level of running a production line solo in three to six months. But, after first focusing on production associates, Engineered Profiles expanded its program to include warehouse/material handling, fabrication, tool and die, and maintenance departments, with all training as paid time. The skills matrix breaks down specific training, tasks and requirements to advance in each department. At hiring, production trainees take “Extrusion 101,” a six-week classroom and hands-on program. Employees then may take additional classes to advance, based on their own initiative. (Salaried associates also take Extrusion 101 so that all employees understand the extrusion process and its terminology.) The skills matrix and current status of every worker at Engineered Profiles is posted in the facility, adding transparency to the company’s promotion system. The company identified a few employees who did not meet all of the skill requirements for their current positions. They were given a year to gain required skills, with no demotion or loss of pay. While there was initial pushback from some senior employees who felt that tenure gave them an automatic right to their positions, pushback faded when employees saw that the program was designed to be objective, with clear paths for advancement and raises. Engineered Profiles has seen distinct benefits. “There is no doubt our training program is a competitive advantage for us in a very tight labor market,” Lamone said. “Showing potential new hires a clear path to earn more money and advance sells very well during the interview process.” The reduction in the gap between unskilled and skilled employees also is impressive. “Since expanding the skills matrix to all operational areas, we virtually have no unskilled labor working for the company,” Lamone explained. Retention at the one-year mark for new hires who completed Extrusion 101 is almost 80%. The skills matrix has added consistency to training and eliminated the potential for favoritism. The advancement path for employees is evident: During the first six months of 2018, 44 employees earned pay increases, averaging $1,834 annually, by participating in the program. Wilbert U, the training program at Wilbert Plastics Services, has resulted in significant benefits across the company’s multiple locations. Nicolet Plastics employs 100 individuals in its Mountain and Jackson, Wisconsin, locations. In business for 30 years, the company produces plastic molded parts for the medical, electronics, agricultural, industrial, consumer, dental and sporting goods industries. Nicolet’s training program has been in place for several years, but it continues to evolve. “We have found as our employee demographics change, so do learning styles and the needs of our employees,” Pichotta said. Nicolet’s program uses an individual development plan (IDP), created following a welcoming period during which employees learn the foundations for success at the company. To create the IDP, the employee, human resources manager, training coordinator and supervisor meet to discuss each employee’s expectations for their roles and how they would like to grow. All employees have quarterly IDP meetings. Employees at Nicolet Plastics can choose from six career paths, each with specific skills to master and an established training program. Pichotta explained that the biggest challenge in implementing the program was “getting everyone on board with a standard approach to training and then, of course, the struggle of production vs. training. The HR team and production leadership team for all shifts meet monthly to identify priority training based on our gaps and how we will work together across the shifts to accomplish our goals,” she said. Nicolet posts weekly training schedules throughout its facilities. “The employees who have been most successful in their quest to gain additional skills are those who were flexible to come in for training on weekends and off-shifts for the opportunity to learn specific skills that may not have been easily attainable on their normal shift,” she continued. Established in 1965, Wilbert Plastics Services is headquartered in Belmont, North Carolina. The company does custom injection molding and heavy-gauge thermoforming for the automotive, medical equipment, appliance, heavy truck, heavy agriculture and consumer products industries, and has 1,250 employees in manufacturing plants and engineering centers in North Carolina, South Carolina, Minnesota, Ohio and Kentucky. 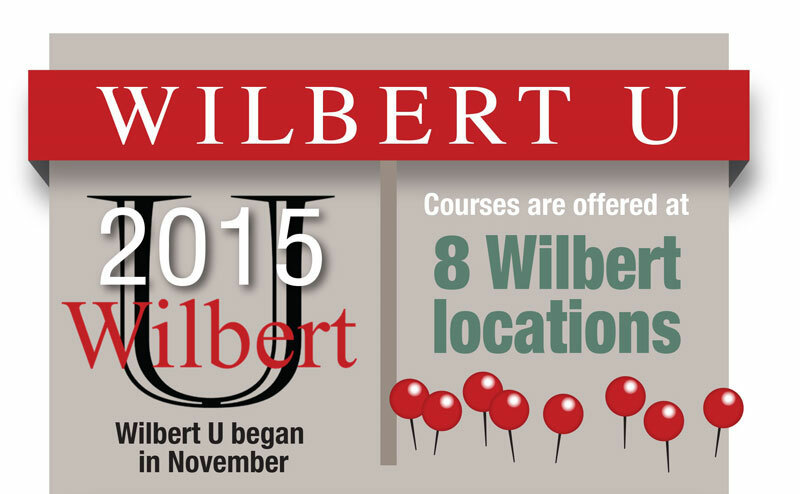 According to CEO Greg Botner, implementing a training program stemmed from Wilbert’s multiple locations. While the company had partnered with some technical schools and community colleges for localized training support, Botner said that creating their own training program enabled them to address needs in all locations. “We still coordinate with local technical school and colleges to tap into outside training programs where it’s practical, and we do engage them for higher level training in electronics or hydraulics,” he said. Wilbert’s program started in 2012 with a canned process-oriented training program. Initially using a training center with computers where employees were paid to take task-specific courses, the company expanded training to reach all employees, with mandatory initial training as well as courses for employee advancement. “What motivated us first was the shortage of employees with the skill set we needed to run our plant and, second, the engagement that we saw early on with the program,” Bottner explained. “People started asking for more, so we broadened the program. That’s when we adopted the name Wilbert U, a takeoff of Wilbert University.” After focusing on individual skills, Wilbert widened its courses to cover complete jobs and, eventually, all of the systems used by the company. The main implementation challenge was that sidelining employees for training affected scheduling and production, causing problems for department managers. Wilbert addressed this with cloud-based training that can be accessed anywhere, anytime. The most unexpected result of implementing their training program is that, in an industry with repetitive production work, the program has invited employees to understand the overall process to which they contribute, engaging people by making their work more meaningful and interesting. Wilbert has seen its program pay off in attracting new employees, in an 18% improvement in retention rate and in empowering motivated employees to advance.